Gracie is of the Eastern Alyawarre language group. 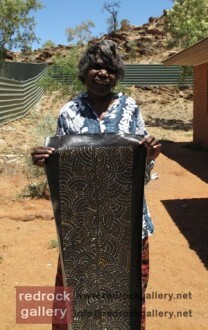 She was born in 1956 at Utopia Station, approximately 250km north-east of Alice Springs. Her family’s traditional country (Alhalkere) is associated with the Mosquito Bore (Lyentye) region, an outstation of Utopia where Gracie, together with her husband and two children, moved some years ago. She is the daughter of artist Myrtle Petyarre who is sister to Gloria Petyarre. Gracie began her painting career in the 1980s at Utopia working initially with batik, before only recently transposing her designs onto canvas. Her paintings are distinctively minimalist, highlighted by delicate dotting and a traditional palette derived from the colours of natural ochres. Her most commonly depicted subject is the bush plum known to the Alyawarre people as Arnwekety. Womens Dreamings tell the story of the journeys of female ancestors. Many of the stories are allied to knowledge relating to desert survival; bush tucker and wildlife food, importance of medicines and female knowledge. Similar to men, women have important religious status and possess their own land tracts and ground designs. During the sacred Womens Ceremonies, participants paint their breasts, shoulders and upper arms and face with patterned designs relating to a particular dreaming. Adorning their bodies is a process; women smear their bodies with animal fat and then using a variety of powders ground from charcoal, red and yellow ochre, imagery is traced onto the body. Different symbols are painted onto the body according to the ceremony subject, time of year and the persons ranking within the social hierarchy. Songs are sung re-iterating ancient journey cycles that pass knowledge but also draw the ancient ancestors closer to the community. Occasionally, woman will dance and re-enact those journeys, dancing and moving their feet through the sand leaving a symbolic pathway.